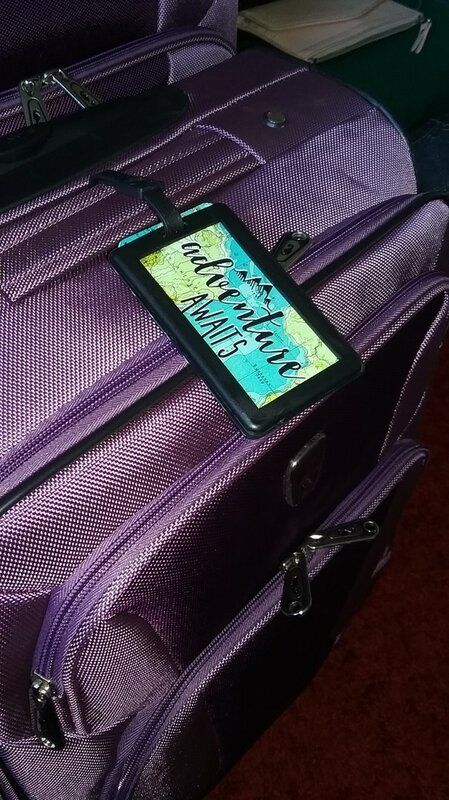 I have had this blog post started since the day after we flew into Buffalo. I have never procrastinated so badly on an assignment that I have cared so dearly about. It has been hard for me to sit down and write one final blog post reflecting on this amazing trip. 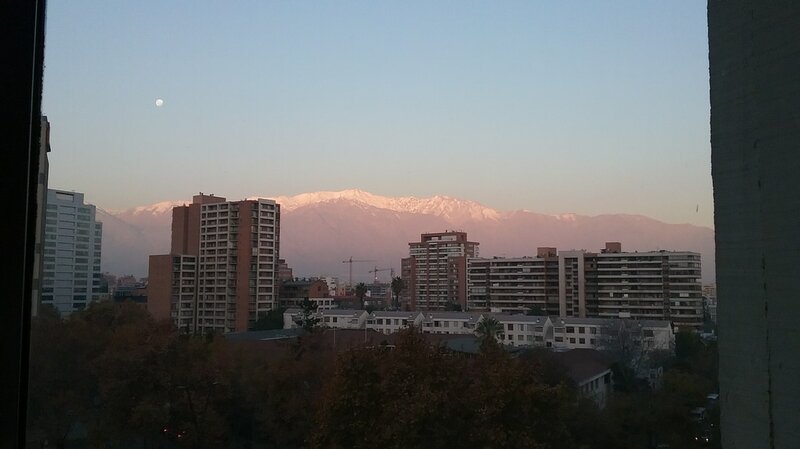 I became accustomed to writing my blog posts sitting at my desk in the room I stayed in while in Chile, looking out the window seeing the Andes Mountains, usually paired with a gorgeous sunset being reflected on the peeks. Being home and trying to write this blog post in my room or some other place in my own home, is not the way I wish to be writing my final reflections of this trip. I have had plenty of time to reflect on my time and recap for everyone all of the amazing things I was able to do while in Santiago, Chile. There are many things I have taken away from this trip that have helped me grow into a more educated professional and individual in society. When I first decided to become a teacher, I encountered many negative phrases and opinions of education that make it hard to remain encouraged about my future career. When you hear the following daily, “Don’t get burned out” “You aren’t going to make ANY money” “All you have to do is babysit and play with kids all day” “If you can’t do, then teach”, it becomes difficult to block out the negative and stay positive. Throughout this trip, the time I spent inwardly reflecting, either through my blog posts or just quiet time I had, gave me the opportunity to re-center my focus any time I felt run down, discouraged, or fed up. As there are more demands to come in my future, I am glad this trip has given me the opportunity to learn to live a balanced life with a healthy mindset. Personally, I have always been interested in the differences of the cultures our world is made up of. I do not want to live with the stereotypical or surface level information I could gain from Google or a book. After being immersed in the culture of Chile, I do not think there is any other way I would want to learn of another’s culture, except through first hand experience. The differences that are represented amongst the populations of this world usually scare people into never educating themselves on the riches that we can encounter. In the present world we live in, there are many people who choose to live by following the saying “ignorance is bliss”, but that also usually comes with fear, anxiety, and worry of what the rest of the world holds. I am excited to continue to travel God’s beautiful world and discover the beautiful people that come with it. The greatest most important thing I learned about myself on this trip is I am absolutely, 100%, no doubt in my mind, positively sure that God intended me to be a teacher. I never felt more energized or refueled than I did after going to a field placement while in Santiago. I plan to continue to travel, to teach, and grow my understanding of the world I am a part of until I can’t anymore. Lastly, I would like to thank everyone that supported me through this trip. Anyone that supported me monetarily, emotionally, spiritually, and any other way you can think of, you are the reason my trip was such a success. I hope everyone is prepared to hear me talk about Chile for the rest of my life because there is no way I can not share such an amazing experience. For the last time, God bless! My typical view of the mountains while I wrote my blog posts. One last view of the Andes Mountains. I miss those mountains! I don't want to leave! ​Our flight takes off in eight and a half hours and I am absolutely not ready to leave this place. I feel like a child who is throwing a temper tantrum saying “I don’t want to leave yet!” (insert tears here because there have definitely been tears already). I am excited to see my family and friends at home, but it would be much better if they could all just come here so I wouldn’t have to leave. No other place has never felt so much like home. Speaking Spanish- Who knew the thing I was most worried about doing coming to Chile would be something I would miss. I do have a small regret of not using it more while I was here, but I will DEFINITELY practice with my Spanish speaking friends at home. Chilean Spanish is very different from any other forms of Spanish though, so it may be challenging all the same. The City of Santiago- What a site to see! There is so much to take in while walking through such a large city. You learn to become very spatially aware no matter where you go because there are dogs, pigeons, venders, pedestrians, cars, buses, taxis and then the towering buildings constantly surrounding you. Although the city may feel crowded at times, the city is always alive with energy whether it is 9 a.m., 12 p.m., or 3 a.m.
Those Andes Mountains- Other than the amazing people I have interacted with while here in Chile, the mountains are the hardest thing for me to say goodbye to. Any time I ever felt overwhelmed with the opportunities I was presented with while here, I could just look up to the mountains and consider the enormity of the beautiful sight to put little moments back into a healthy perspective. Every time I looked at them I was awestruck by the creation God made for us. Chileans- The interactions you have with the people surrounding you, no matter where you go, can make or break your experience. Every person that hosted me while here is the reason Chile became like a home away from home. All of the teachers at ECELA and Universidad of Mayor helped develop my language ability and my professional understanding of the field of education. All of the children I interacted with during our school visits reminded me why I have decided to be apart of the field of education. My host mom and temporary brother, Pachi and Tomas, have done nothing but make me feel as comfortable as possible after long days and late nights in their home. Finally, our friends that started this entire trip by visiting Buffalo in January have a special place in my heart. It is such a great feeling to know when you have made life long friends. Sorry to break it to my new friends, but there is no way to get rid of me now! Instant Coffee: The first thing I am buying when I get home is a double double medium coffee with a shot of hazelnut from Tim Horton’s. Not Flushing Toilet Paper: In case any of you didn’t know, you don’t flush toilet paper here in Chile. Traveling on the Metro during Rush Hour: Fun fact about me, I am EXTREMELY claustrophobic. There is a very clear difference between the two lists that I have made. One far outweighs the other and I don’t think it is hard for anyone to tell that this trip has been the BEST experience I could have asked for. Te extrañare y te amo Chile! I will miss you and I love you Chile! A school like this exists? ​Last Thursday our entire group from Buffalo State College observed at a public school named Colegia Diferencial Amapolas. This school specifically helps children with physical disabilities and the majority of the student population uses wheelchairs and walkers throughout the day. There were many systems in place that were used at the school to help the children communicate and function throughout the school day. One of those systems included a color system that marked the wheelchairs of the students with red, green, or white. These colors would tell the teacher or adult how independent the student was when moving their wheelchair. The goal of this system is to instill independence in the children who are able to control their wheelchairs. 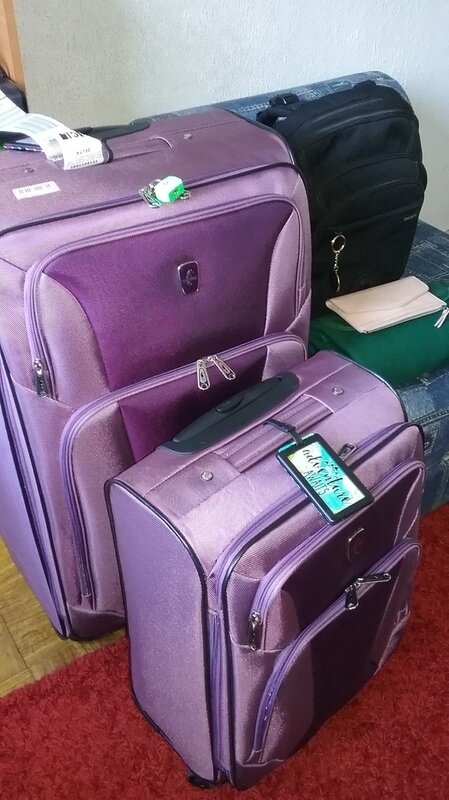 This system also helps the students take initiative and ask for help or communicate their needs and wants to others verbally if they need help moving their wheelchair. Another system that was put in place by the school was a set of movements to help students communicate if they are not able to speak verbally. Some of these movements included the students turning their head to the left if they are trying to say “yes” or turning their head to the right if they are trying to say “no”. Having such systems in place continue to prepare students to function and communicate in society. The classroom I observed had a group of 6 students and all of them were in wheelchairs. The severity of the disabilities of these children also effected their muscle use to communicate verbally. Even through the noises and excited movements the children exhibited, I was able to understand the joy these students felt being at school and working with a guest in their classroom. The teachers of the classroom I was in created a sensory rich environment with different sounds, music, lights, and physical objects for the students to touch. This created a very stimulating environment for the students and helped keep the students engaged in the content being taught. A student with out a disability would typically not be able to handle such a large amount of stimulation, but the students in the class I observed were very mature in the way they handled the amount of stimulation present. While we were there, the three teachers in the room put on a performance of a children’s story. They acted out the story and used props and sounds to help convey the message of the story for the students. The teachers dressed up, used the lights in the class, used music and sounds, and had props for the students to touch while they were telling the story. The best part about this amazing lesson was that the teachers were not aware they were going to have visitors to watch their lesson. Whether they were being observed or not, the teachers created a lesson that could be used as a model for any teacher working with students with disabilities. ​I have never experienced a school, in Chile or in Estados Unidos, that has been so accommodating for the individual needs of each student. The most surprising part of this school to me was their ability to accommodate the majority of the students’ needs as a public school, with minimal funding. The first thing I said to my professor after visiting the school was “I would love to work in a place just like that”. One week later, I am collaborating with my professors and the professors of Universidad Mayor to come back and do research or complete my Master’s degree in a school just like the one I described or that exact school. The details are far from being discussed and it may not actually happen, but it is amazing how quickly relationships and professional connections can form, no matter where you go. It has always been a dream of mine to travel around the world and I began fulfilling that dream by coming to Chile. Another dream of mine is to teach internationally in another country. Now, I am one step closer to achieving that dream of mine right here in Chile. You’re There to Teach, Right? 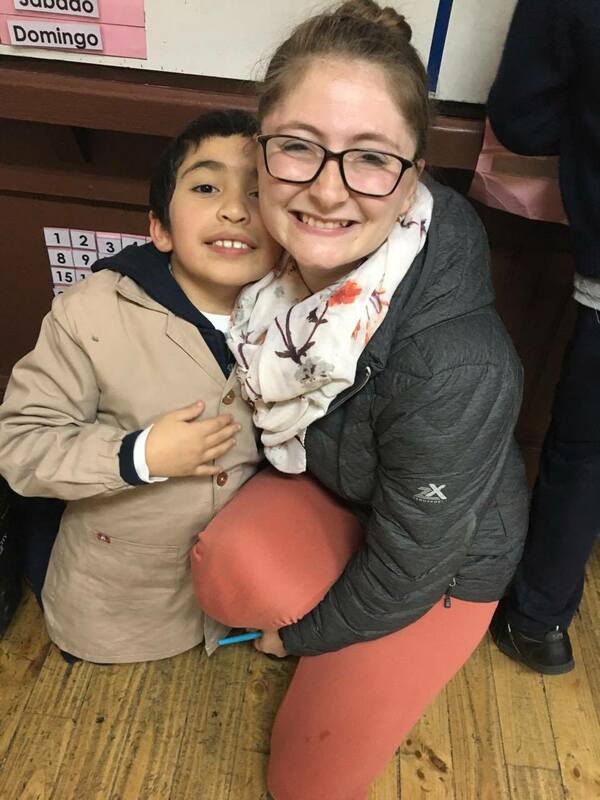 ​There has been an abundance of activities we have been involved in since arriving to Santiago, but the main reason I am here is to grow as a professional preparing to be a future educator. Before arriving in Santiago, the professors of Buffalo State College and Universidad Mayor collaborated together to plan field placements in public, subsidized or charter, and private schools for our group to attend. All of the professors worked hard to collaborate with schools of diverse orientations so that we all could experience the atmosphere of as many different schools as possible. Overall, I was able to visit five different schools since arriving in Santiago two weeks ago. I have had the opportunity to observe and teach in public, subsidized (charter), and private schools here. I am so grateful and thankful to all of the hard working people involved in planning this trip. Without their hard work, I wouldn’t be able to have such a broad range of experiences in Chilean schools. Anyone who has ever prepared for their future career knows that hands on experiences are better than any in class conversation or textbook activity to equip you for the field you are entering. Anyone who has ever created expectations for these hands on experiences knows that the experience can either exceed your expectations or you can create too high of expectations and be let down. Anyone who has ever tried to plan the events that occur in those hands on experiences also knows that everything does not always go according to plan. Every school I went into I had to have lessons prepared for a broad range of grade levels and academic levels. When ever we went to a school, we would teach during the students’ English class or their foreign language period, if the opportunity presented itself. So, we had to be prepared to accommodate for a broad range of language abilities as well. No matter how much time I spent planning for how the lesson would go or how the students would react or respond, nothing came close to the experiences I had. Every single second I spent in the classrooms here in Chile has been full of rich learning experiences that have benefited me professionally AND personally. My expectations were far exceeded every single time. Can you really ask for anything more? I have learned far too much to write in one blog post, but there are some school visits in particular that have stood out to me. I was a part of the first group to attend the first school visitation at the public school, Colegio Maestra Elsa Santibañez. Our group was unsure if we would just be observing in the classroom or if we would be teaching, so we came prepared for anything. As soon as we walked into the school you could hear the children playing and we automatically knew we were arriving during their mandatory recess time. I was extremely nervous as to how I would communicate with the students because we had only just begun our Spanish classes at ECELA. There was no stopping the excitement of the students or myself during those first twenty minutes of introductions in their courtyard. Although the student and I were both talking to each other, it was in both English and Spanish, all jumbled together. Did we both understand completely what the other was saying? No. Did it stop the beginning of a relationship from forming? No. When I have my own classroom, I will have English Language Learners as part of the student population. A language barrier does not have to be something scary or intimidating for me as the teacher. It can be an exciting challenge that the student and I can face together as co-learners. These are the student I interacted with during their recess time at Colegio Maestra Elsa Santibanez. They thought it was hilarious to here me pronounce their name in English. Another school I was able to attend was a subsidized school named Colegio Lorenzo Sazie. Our group visited two classes that day, one was 12th grade and the other was 1st grade. In the 1st grade classroom we observed, there were 38 students and one teacher. When we walked in, we could barely stand in the front of the classroom to introduce ourselves because there were so many desks for all of the students. Although there was very little physical space in the classroom, it did not prevent the teacher from engaging the students when teaching the new vocabulary with body motions. If you can imagine a room full of 38, 1st graders standing behind their desks “Choo-chooing” like a train, you can imagine how adorable it was to watch and participate. I moved to the back of the class very quickly to avoid distracting the students and I noticed a little boy sitting in the corner plugging his ears. I asked him to return to his seat, but he was not having it, so I sat down with him. I started doing the motions with him for the vocabulary words they were learning of different toys. Eventually he stood up and moved back to his seat, so I thought he was doing it to get away from me. Two minutes later he was standing at my side again pulling me with him so we could go to his seat together. ​I spent the rest of the class working with this student, Rafael. He continued the entire lesson with his ears plugged and spoke very softly, but we were able to complete his worksheet of cutting out the pictures of the new toys they learned and gluing them to the chart that was handed out. From what I observed, he had issues with any sensory related stimulation and was most likely on the autistic spectrum. His teacher approached me and told me she was surprised and happy that Rafael was able to work so well with me because he usually doesn’t interact with his teacher or the other students. I was willing to work with Rafael on what he was comfortable with, not what the teacher or his other classmates were comfortable with. 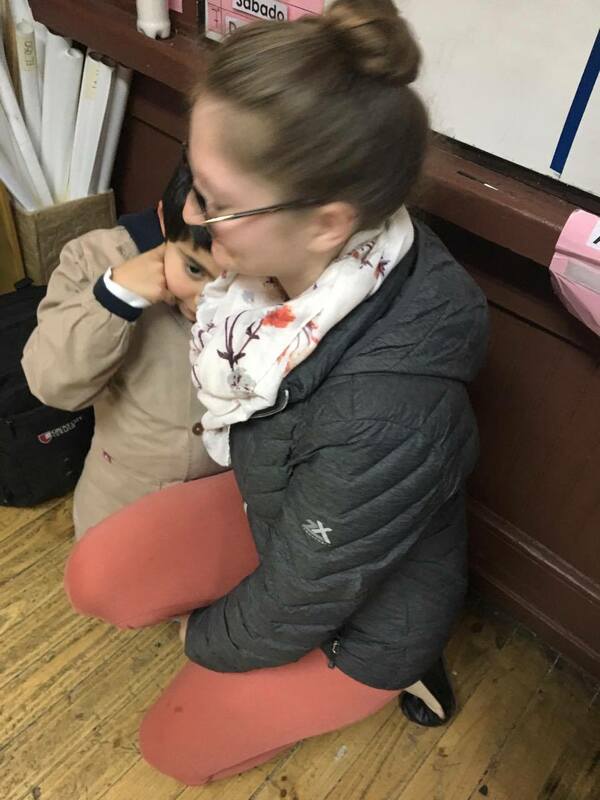 It is understandable that when you have 38 students in your classroom you can not provide the one-on-one attention I was able to give to Rafael. It was still so encouraging and rewarding to see a student push themselves outside of their comfort zone because they trusted I would help them, not hinder them. Rafael and I saying good bye to each other at the end of the lesson. I know the picture is a bit blurry, but this shows the way Rafael remained the majority of the class time; with his ears plugged and sitting next to me. ​​I can write more, but I will share more experiences in a Part II blog post. Of these two significantly short interactions, I learned so much from the children and the other professionals. This very lengthy recap and reflection only covers about and hour of my experiences here in Santiago. So, imagine how much more I have been able to learn and experience here in these past two weeks. It is painful to consider that I only have one more week in this place that has so quickly begun to feel like home. 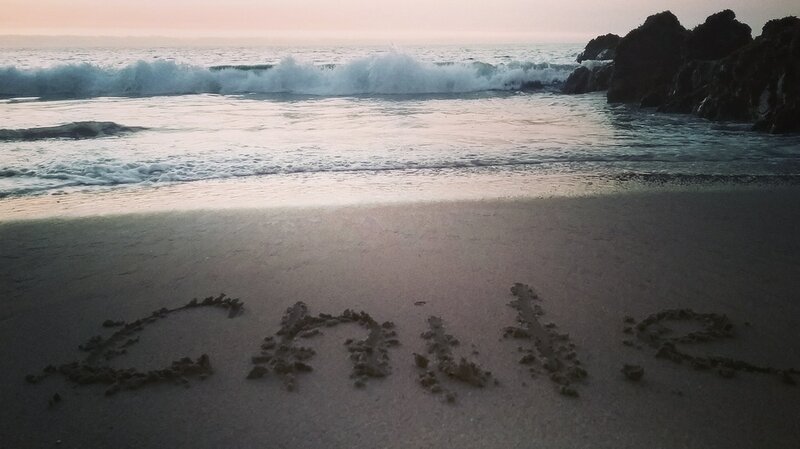 Chile has definitely stolen my heart and I plan to continue to experience everything this country has to offer in the time I have remaining in this beautiful place. ​This weekend, on Saturday, I was able to trek through the Andes Mountains! Everything about this trip is a once in a life time experience, but I am so beyond blessed to be able to feel the enormity and beauty of such a magnificent landmark like the Andes. I was never sure if I should look left or right to see the most beautiful view, but it did not matter where I looked because we were surrounded with the AWEsome snowcapped peeks. As I continued to hike and walk along our trail, I felt smaller and smaller in such a large mountain range that drew such a diverse population to it. The further I tried to look towards the end of the range I was struck with the realization that no matter how far I tried to look I could not possibly see to the end of the peeks. It is hard for the human mind to process the idea of eternity, but being surrounded by the mountains brought me as close to comprehending forever as I could imagine. The trail that was chosen for us was a flat path so it would be easier for us to hike and take in the beautiful views of the mountains and the lake that we were next to. As we were walking we saw kayakers in the lake that were so small they looked like ducks floating in the water because they were so far away. Eventually, we hiked far enough that we were on the shores of that same lake. How does this relate to education you ask? What automatically comes to mind for me is the cliché saying “Everyone has their own mountains to face”. The academic demands that are put on students in current day can feel overwhelming and impossible to comprehend just like it was for me to comprehend the enormity of the Andes mountains or for me yo comprehend Spanish. My job as a future educator is to help students manage the multiple demands of a school day so they do not feel unable to keep up with the pace of the information being shared with them. By having time to process my surroundings and everything I was taking in at the Andes, I was able to maintain a healthy and calm disposition. It is statistically proven that if teachers do not give students a sufficient amount of wait time to comprehend, and then respond to any questions or information, it can lower the willingness students will have to be involved in a classroom. I plan to give my students the sufficient amount of time to process all of the information being shared with them in my classroom and throughout the day. This can cause a trusting relationship to form between teacher and student and therefore, a more productive classroom environment can be created. Here are some photos that make it completely obvious I was overjoyed and overwhelmed with the Andes. We met a dog and I named him Sammy. They have as many dogs here as we do squirrels. I felt the water and it was not as cold as it looks. Today was our first day to really travel in the city and experience all it has to offer! We began the day with one of our classes at ECELA from 9-11 am, which is our clase de conversación. We usually have another class after that from 11 am-1 pm, which is our clase de gramática. Instead of taking our second class, we went and visited the Museo de Memoria. ​After visiting the museum, we all visited Barrio Lastarria, Museo de Nacional de Bellas Artes, and Cerro Santa Lucia. My favorite part of the entire day was climbing up to the top of Cerro Santa Lucia. We took about a 20 to 30 minute hike to the top of the hill and we were greeted by the breath taking view of the Andes Mountains at sunset. No matter how many pictures I take, there is no image that can capture the state of awe the mountains make you feel. The Creator of our world has a beautiful imagination and tomorrow I will get to climb them. ​Although today was overwhelmingly amazing, I felt many emotions throughout the day that I have not had time to process until now. Beginning at school with the demands of learning to produce Spanish through immersion, to learning about the hardships of the people of Santiago, to experiencing the overwhelming presence of the Andes Mountains, has been somewhat of an emotional roller coaster of ups and downs. As a teacher, there will be events in my classroom that may cause the same emotional demands of myself or my students. This trip to Santiago is teaching me how to handle the emotional highs and lows we all will experience in life. I hope to be prepared to help my students through the same kind of emotional demand life brings and I hope to create an environment in my classroom where the emotional strain is limited. There are muchas diferencias (many differences) in Chile compared to the United States. It has been amazing taking in all of the differences and noticing some similarities too. Before leaving for Chile, every member of our class was assigned a group role on our trip. I was chosen to be the Ambassador. My job entails helping my classmates be aware of their cultural presence in Chile. I try to help everyone be the best representative of our culture, country, and school while we are here in Santiago. Any Chilean cultural differences that I have found and researched, with the help of our professoras, have been shared with the group so that we can be more aware of the customs and become more acclimated to the change. One very large difference that I have noticed here is everyone is able to speak or understand English! Language is a very large part of a country’s culture. Although that is a huge help to me because I speak very little Spanish, that is not something you see in the United States. Every person I have talked to, such as a waiter, a pharmacist, a clerk at the grocery store, or the bus driver, have been able to understand what I am saying and sometimes respond back in English to help me. In the United States there are foreign languages present, in fact a large number of different languages are present in Buffalo alone, but people who do not speak English as their first language are expected to assimilate and learn fast. For the most part, the States’ culture is monolingual, and we are one of the only countries, if not the only country that is like that. This is the view of the Andes Mountains from my window at my home stay. I get to see this every morning! Not so long ago I remember getting an email from Dr. Patti, Dr. del Prado, and Dr. Schmidt that I was accepted into the IPDS Chile program. In late November to early December of 2016, I had been checking my email constantly knowing I would be getting a message telling me if I was accepted into the program or not. When I received the email I was at a movie theater with a friend. When I read that I was accepted into the program, there were audible sounds too loud for the liking of the other audience members at the movie because I was asked by someone "Would you mind keeping it down a bit?" Those around me, including my friend, were not a fan of my over the top reaction, but there was no way anyone in the world would have been able to stifle my excitement. Every day, my excitement continues to grow as my countdown dwindles with only 12 days until we leave for Santiago, Chile. There has been lots of preparation leading up to this trip and I am beyond ready to do more than talk about it and begin to experience it. So far, my fellow classmates and I have been able to interact with our pen pals that we were paired with from the Universidad of Mayor through emails, messages, social media, and in person. We have had class sessions every Monday throughout the semester preparing activities to implement in the classroom placements we will have while we are there, learning how to work with students who are English Language Learners, and preparing to travel as ambassadors of Buffalo State College and our country. Although I am beyond excited to be able to have this once in a life time experience, there are other things that I am nervous about as well, mainly speaking in Spanish. As I have been preparing for this trip and have been telling people that I am traveling to Santiago, Chile, the most popular question I have been asked is "Do you know Spanish?" My answer is always "A little. I remember some from when I was in high school." Which is when everyone proceeds to give me a look of "Good luck with that." or some have even said it out loud. I think the most challenging part about this trip for me will be the language barrier I will have with the people around me. I am scared that it may take away from my experiences while I am in Chile. As a future teacher, this situation of a language barrier will give me the opportunity to experience what it is like being in the student's shoes for those who are English Language Learners in the classroom. Throughout my college career, I have had many opportunities to work with children who do not speak English as their first language. This can cause many issues for students who are learning challenging content with minimal knowledge of the language they have to learn it in. While in Chile, the roles will be reversed and I will be the student who will have to have an abundance of patients while being immersed in this new language. As a teacher who plans to become certified to work with English Language Learners, there is no better opportunity to learn exactly what these students feel everyday they walk into their classroom in the United States. The count down continues as I prepare to see my Chilean friends again who we met in January. I am ready to try all of the new foods that were suggested to me, especially the completo! Maybe the next time you hear from me, I will be in Santiago, Chile! This is a completo, which has been explained to me as a Chilean version of the United States hot dog. It has avocado, tomato, and mayonnaise on it. I am currently a student at Buffalo State College working towards achieving my undergraduate’s degree in Exceptional Education with a concentration in English. I am extremely passionate about working with children and I believe it is my God given talent to teach. I grew up in the Buffalo Public School system and I dream about teaching in inner city schools with 1st graders. I am currently a teacher's aid at Edukid's Child Care Center in Buffalo and I am very grateful for the experience I am getting working with the children there. In my free time I enjoy playing my clarinet in the Buffalo Niagara Concert Band and dancing, specifically ballet.